VOLDA (Panorama): This weekend the eyes of extreme sport community turned to Volda and X2. The student city of Volda is known for its many events happening through the year. Veka (international musical festival), Dokfilm (international documentary movie festival) and AnimationVolda (international animation festival) are just a few examples. But this weekend it was all about extreme sports at the X2 event. X2 could be considered a traditional event taking place in Volda. This year the festival reached its 10th year anniversary and celebrated by adding a new discipline to already extensive parade of extreme sports. Anyone who found themselves in Volda between 16th and 19th of April could see different adrenaline junkies compete in free riding, base jumping, surfing and many other extreme sport disciplines. But for the first time in the history of X2, skateboarding joined longboarding as another «board on wheel»-based discipline. That was enabled by the fact that Volda kommune recently finished the long delayed construction of a local skatepark. This drew the attention of a new group of people towards Volda and it’s college university. People like Magnus Mongstad, who originally comes from Molde, loves skateboarding and was asked to be in charge of this part of X2. And he sure did a good job. «When my friend and I heard that they are building a skatepark in Volda we said to each other: Dude, we have to go to study in Volda,» Mongstad said. The skatepark in Volda is well-built and offers possibility to perform most of the disciplines of skateboarding. And it is virtually incomparably better than its equivalent in Molde, which basically falls apart right in front of your eyes. “The skatepark in Molde is going to be teared down to make space for some houses. The skateboarding community in Molde is still very small,» Magnus Mongstad said. 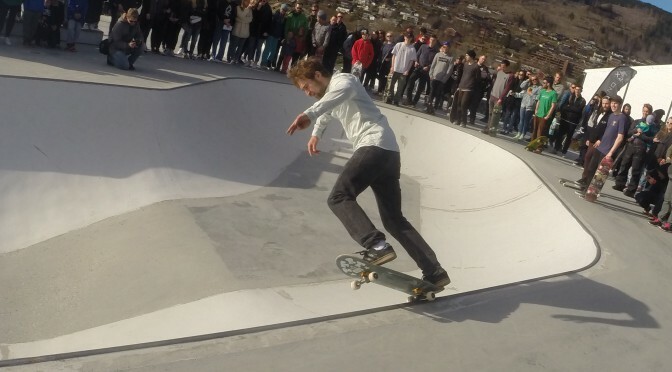 The organizers used the full capacity of Volda Skatepark. The competition consisted of Street Jam, Bowl Jam and a game of skate. The organisers were very lucky because the infamous Sunnmøre rain backed off for a while and made space for a nice sunny day which of course amplified the good atmosphere in the park. Not to mention that concrete, from which the park is constructed, proves to be incredibly slippery when wet. «It’s great skateboarding here today. The competition is pretty low-key and not too serious. That is what I like about it,“ said Jørgen Rodem,» who also partook in XWave – the surfing part of X2. This sums up the atmosphere in the part on the day of XSkate, with very little complications and drawbacks. “This is the first time I have arranged a skateboarding competition and I am really surprised how smooth it went,” said Magnus Mongstad. The festival area was, for a small place like Volda, staggering. The street and adjacent parking lot in front of local student house Rokken, which serves as Voldas main night club, were closed for the purpose of the festival. Party tents were built. That gave X2 chance to run two stages with different program at the same time. One of the stands in the festival area offered different kinds of beers from local Trollbryggeriet on tap, which is a rare sight at night outs in small communities like this. The free spirit and extreme sport atmosphere was underlined by graffiti exhibition taking place two out of three festival nights right at the festival area. The evening which started with XSkate was closed by the concert of local legend rap group Side Brok from Ørsta, whose status around ensured a full party tent when they stepped on the stage and gave their show. The next day a traditional long boarding competition XBoard went on. The streets of Volda offer a great track for long boarders to race down neck and neck in incredible speed. Unfortunately for the competitors XBoards competitors were not as lucky as XSkates and small drizzle of rain wetted the track every now and then on that day. On the other hand the audience was pretty lucky. “We had a great weather with some rain, which makes the competition harder and audience happy because of many falls resulting,” said Espen Eliassen, the main organizer of XBoard. X2 once again brought an event with relaxed atmosphere and great parties to the surprisingly rich cultural pool of Volda, the city with only 8000 inhabitants.